Are you a sweet or savory breakfast person? I like both. (Sometimes at the same time.) But in spite of having a huge sweet tooth, the savory breakfast usually trumps for me. Either way, you’re covered this weekend. If you’re a sweet person, you have that French toast to make. And if savory is your thing, here’s the plan. Pick some potatoes. I know I’m being a little preachy here, but let me just gently suggest that if you have never bought a potato from your winter farmers’ market, you should give it a try. I buy plenty of supermarket produce in addition to supporting my local farmers when I can, but there are a few things that are just so much more flavorful when I buy them from the farmers’ market that they seem like different vegetables. Potatoes are one of those things. But I should also say that I am no potato snob. Potatoes are one of my favorite foods and I always have a 5 lb. bag of grocery store potatoes lurking in the basement just in case. (Is that weird?) And I love them. Just like I love the even more flavorful fancy ones. I had a bag of purple potatoes. You can use whatever potatoes you have or choose to acquire. This is a riff on the Smoky Cauliflower Frittata to the extent that I used the smoked paprika and smoked cheese combo again. I was using up leftover baked cod, but I think this recipe would also be great if you used a smoked fish instead and left out the paprika. Or you can leave the fish out altogether, of course. 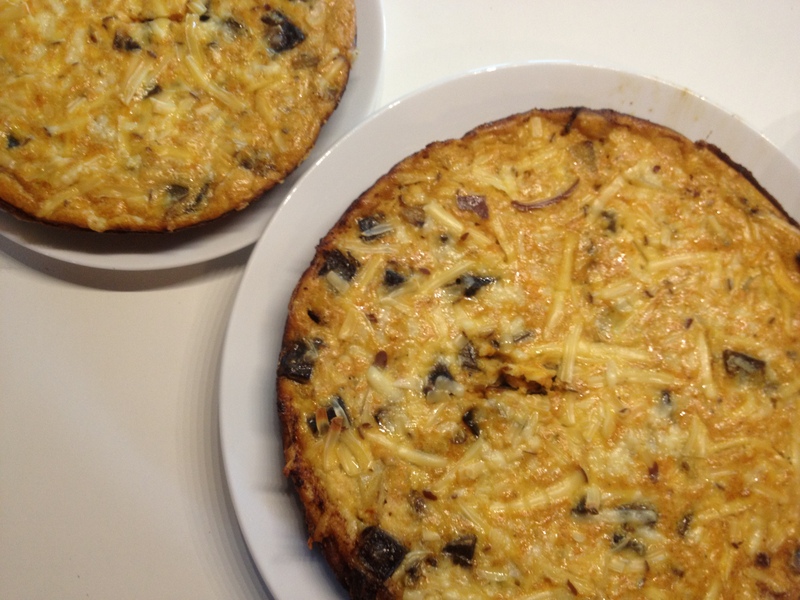 We roll with a lot of vegetarians, so we made one frittata with the fish and one without. Purple Potato Frittata, with or without Cod: Dice a few potatoes into small cubes and saute in olive oil over medium high heat with a large diced onion until the potato is edibly tender. Meanwhile, whisk 6 eggs with 1/4 c. Greek yogurt, 2 tsp. smoked paprika and salt and pepper. Mix two handfuls of smoked cheese and one of sharp cheddar into the eggs, along with the cooked potato and onion mixture. Flake some cooked or smoked fish into the bowl if you’re using it. Mix gently to combine everything. Heat a little more oil in the same pan you used to cook the potatoes, then pour in the egg mixture and cook about 5 minutes over medium heat until the edges are set. Scatter one last handful of cheese on top of the eggs. Transfer to the oven and bake at 375 for another 10-12 minutes, until nearly set, then turn on the broiler for a carefully attended minute or two to brown the top. Serve with toast and fruit for breakfast, or with a salad for any other meal. This entry was posted in Breakfast, Eggs, Fish and tagged breakfast, brunch, cooking, dinner, eggs, family, fish, food, homemade, lifestyle, recipes on March 9, 2012 by emmycooks. I love frittatas too, they are such a delicious way to use up whatever you have! Your frittatas look great! I don’t think I have ever put cod in a frittata before, but with the paprika it feels totally Spanish to me. Have to try this . . .